A term male neonate weighing 3 kg was brought to the emergency room with a history of swallowing difficulty and respiratory distress. The diagnosis of the vallecular cyst was made on direct laryngoscopy. The cyst was successfully treated with endoscopic marsupialization. Vallecular cyst is a rare but recognized cause of respiratory distress in infancy or immediately after birth. It has been associated with sudden airway obstruction resulting in death. 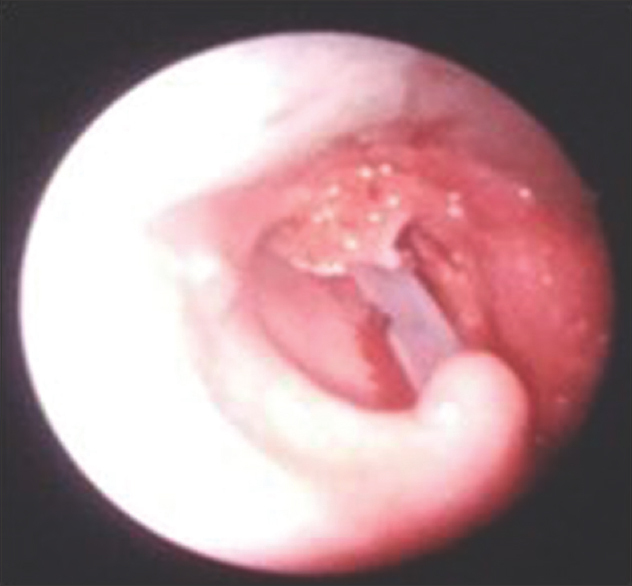 The vallecular cyst consists of a unilocular cystic mass of variable size arising from the lingual surface of the epiglottis and containing clear, noninfected fluid. The ductal obstruction and the embryological malformation are thought to be the pathogenic factors of the vallecular cyst. The histology of the cyst contains the respiratory epithelium with mucous glands lined by squamous epithelium. A term male baby was born by normal vaginal delivery to G3P2 L2 mother with gestational diabetes mellitus. His birth weight, length, and head circumference were above 50th percentile, respectively. He cried immediately after birth. Apgar score was 7 and 8 at 1 and 5 min. He developed respiratory distress with excessive oral secretion needing suction and continuous positive airway pressure (CPAP). He was admitted to neonatal intensive care unit and connected to ventilator CPAP. Intravenous fluid was started. The feed was introduced on day 2 of life postdepronging. He developed respiratory distress postfeeding with increased pooling of secretion in the throat. The laryngoscopic examination demonstrated a cystic mass at the base of the tongue in the vallecular space [Figure 1]. No images including magnetic resonance imaging were done to diagnose the cystic mass. He underwent video-assisted laryngoscopy and the cyst was found to be attached to the oropharyngeal surface of epiglottis. The marsupialization of the cyst was performed. The cyst was split open and the edges of the slit were sutured, and the edges form a continuous surface from the exterior surface to the interior surface of the cyst and the area remained open to drain freely [Figure 2]. The postoperative period he did well and got discharged on direct breastfeeds. He was followed up postdischarge. There was no recurrence of the cyst. Laryngeal cysts are rare in infants and children. Aryepiglottic cyst is the most common laryngeal cyst in children, followed by the vallecular, ventricular, and subglottic cyst. The presenting symptoms of vallecular cysts are usually related to upper respiratory tract obstruction. Stridor is the most common symptom. In our index case, the presentation was difficulty in swallowing and the pooling of secretion with respiratory distress. Infants with vallecular cysts may present with a secondary form of laryngomalacia which can be explained by altered airway dynamics caused by progressively enlarging cyst which cause increased inspiratory negative pressures, contributing to supraglottic prolapse. The definitive diagnosis of a vallecular cyst can be obtained from bronchoscopy or direct laryngoscopy. The term ductal cyst originates from the classifi cation of De Santo et al, in which they grouped laryngeal cysts according to their location and surface mucosa. Newman classifi ed laryngeal cysts as epithelial, tonsillar, and oncolytic cysts. The differential diagnosis includes midline masses such as congenital ranula, thyroglossal duct cysts, dermoid cyst, teratoma, lingual thyroid, lymphangioma, and hemangioma have to be considered. Although stridor is the main presentation in the neonates with upper airway cysts, our index case report highlights the importance of laryngoscopy in neonates with swallowing difficulty. 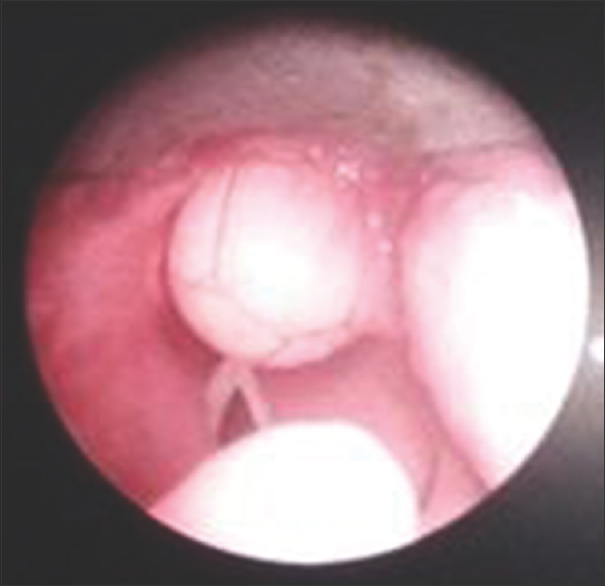 Ruben RJ, Kucinski SA, Greenstein N. Case report: Cystic lymphangioma of the vallecula. Can J Otolaryngol 1975;4:180-4. Gutiérrez JP, Berkowitz RG, Robertson CF. Vallecular cysts in newborns and young infants. Pediatr Pulmonol 1999;27:282-5. Ahrens B, Lammert I, Schmitt M, Wahn U, Paul K, Niggemann B, et al. Life-threatening vallecular cyst in a 3-month-old infant: Case report and literature review. Clin Pediatr (Phila) 2004;43:287-90. Tuncer U, Aydoğan LB, Soylu L. Vallecular cyst: A cause of failure to thrive in an infant. Int J Pediatr Otorhinolaryngol 2002;65:133-5. DeSanto LW, Devine KD, Weiland LH. Cysts of the larynx – Classifi cation. Laryngoscope 1970;80:145-76. Newman BH, Taxy JB, Laker HI. Laryngeal cysts in adults: A clinicopathologic study of 20 cases. Am J Clin Pathol 1984;81:715-20.